Get Messy! 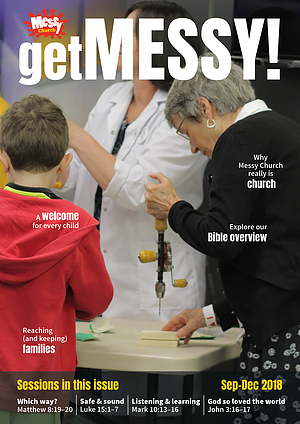 is a four-monthly subscription resource for Messy Church leaders. Each issue contains four session outlines (one per month), including planning sheets and take-home handouts, together with information on the latest resources and events. It also seeks to encourage and refresh Messy Church leaders by providing monthly Bible studies, a column on taking time to recharge, and a problem page. Other features include a youth column, a day in the life of a Regional Coordinator and stories from Messy Churches around the world. Get Messy! September - December 2018 by Olivia Warburton Warburton;Lucy Moore Moore was published by BRF (The Bible Reading Fellowship) in July 2018 and is our 17456th best seller. The ISBN for Get Messy! September - December 2018 is 9780857466136. Be the first to review Get Messy! September - December 2018! Got a question? No problem! Just click here to ask us about Get Messy! September - December 2018.